Learn a better charting format when your Excel Chart Secondary Axis Columns Overlap with 3 data series. I didn’t love the last chart we created that solved the problem that Whitney was having, however, it didn’t seem like it was amazingly clear as to which column went with which axis. When we are dealing with 2 chart data series it can be assumed that the left most column corresponds with the left (primary) axis. 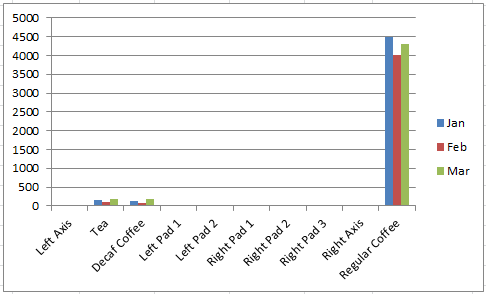 Likewise, the right most column would correspond with the secondary axis (right). 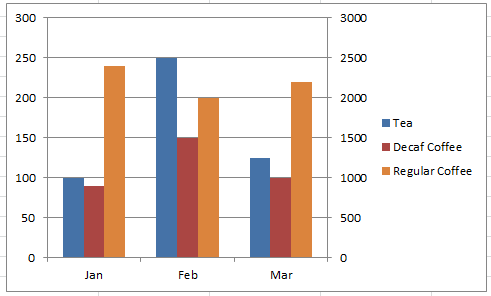 In this tutorial, I will be combining 2 concepts for a work around when your Excel Chart Secondary Axis Columns Overlap for 3 data series. this is the primary technique of adding columns of blank or zero value data so that we can position the columns in a way that Excel will not overlap the columns. This is a really cool technique that I created awhile ago, but we will use it to show which columns correspond to which axis. So the first steps of this process is to create padding columns for each axis. We will need 5 data series for each axis. One will be used for the Legend Grouping on each axis. 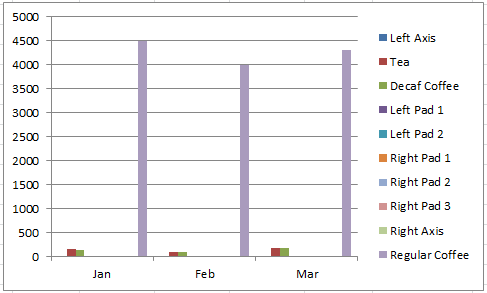 Then one data series will be used for the gap between the columns. The rest are to make sure that the columns don’t overlap. You are now ready to create the chart. 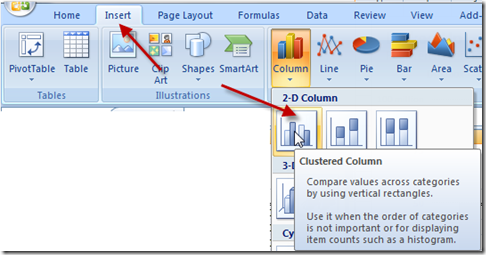 Highlight the range A1:K4 and go to the Insert Ribbon and select Clustered Column Chart. Because of how we setup our data, we will need to switch rows/columns for the chart. You can do this by selecting your chart, then go to the Design Ribbon and then click on the Switch Row/Column button in the Data grouping. 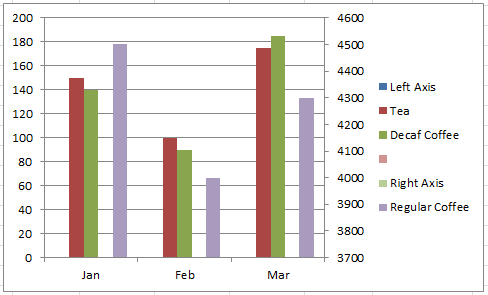 The next step is to move all of the data series that we want to on the secondary axis. This will include the Regular Coffee series as well as all of the Right Pad series. To do this, click in the chart and then select the Regular Coffee series and then press CTRL+1 to launch the Format Data Series dialog box. Then select the Secondary Axis radio button in the Series Options tab. Perform this for all of the Right Pad data series. Next we want to remove any unneeded legend entries from the Filler/Padding data series. First, delete the text that you have entered into the spreadsheet in I1 for Right Pad 3. We want to keep the legend entry as a spacer, so that means we don’t want to delete it, just remove the text so that it appears blank in the legend. Second, we need to clean up our Legend entries and remove the ones that are not needed (the ones titled Pad), first select your chart. Then select the Chart Legend. Next select a Legend Entry and finally then press the delete key on your keyboard. Finally we just have one last clean up on the Legend and that is to set the Fill type to No Fill. I think that, when you have a 3rd or more data series in your chart and you use a secondary axis, this is a much better format for Excel Chart Secondary Axis Columns Overlap issues. What do you think? Let me know in the comments below. Watch me combine these 2 techniques in this quick Video Demonstration below. Note that I have added an extra padding column in the write-up above so that the columns are all the same size. You can download the sample file here to see the charts described above in action. I think that these are really cool techniques. Excel is so powerful but it is great to have work-arounds. 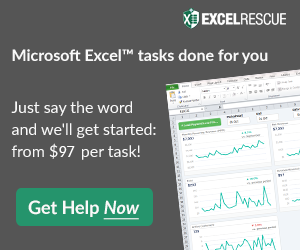 What is your favorite tip and trick in Excel? Let me know in the comments below. The numbers on the left axe with the same colour of Tea column (for example red) and the Decaf Coffe with a shade of Red. The numbers on the right axe with the same color as the Regular Coffe column (for example a Orange). The numbers could be bold. It’s not so Excel defiant.